One of his ongoing projects is compiling a collection of photos of people reading, entitled “Fusion: The Synergy of Energy and Words” (Part I and Part II). The idea to shoot photos of people reading was itself prompted by his relationship with legendary Hungarian photographer André Kertész, who was also fascinated with images of people reading. 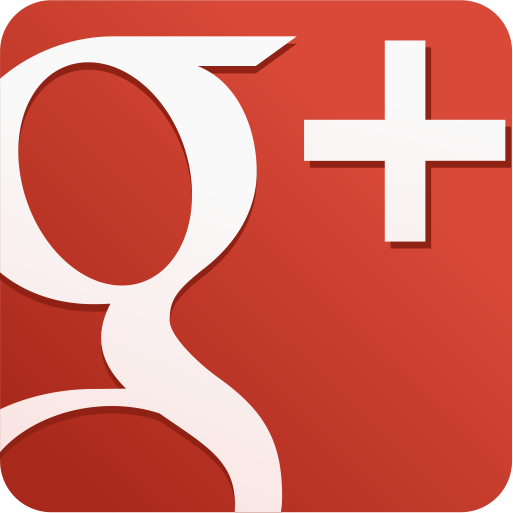 (You can view a gallery here). McCurry’s photos cross these cultural and socioeconomic boundaries. 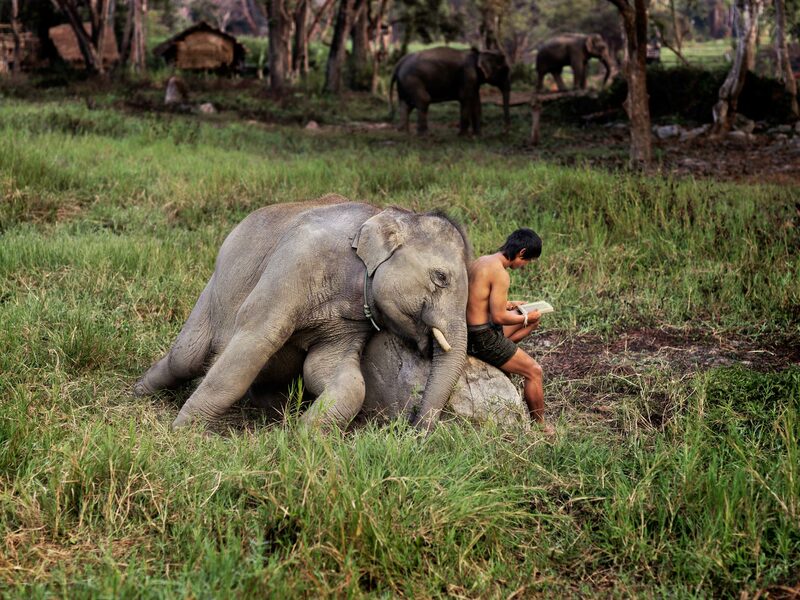 His personal favorite of his collection is a photo of a young Thai man reading a book while nestled up to the back of an elephant, shot earlier this year (and reproduced below). Among the two dozen images posted online is photo of a group of Chinese men perusing newspapers through a shop window, another of an Afghan shopkeeper reading in his modest stall, and one Italian monks in contemplation with their Bibles. I’m longtime fans of photojournalist Peter Menzel, whose visual anthropology captures the striking span of humanity’s socioeconomic and cultural spectrum. His Hungry Planet portrayed the world’s sustenance with remarkable graphic eloquence, and today I’m turning to some of his earliest work, doing the same for the world’s shelter: Material World: A Global Family Portrait — a beautiful visual time-capsule of life in 30 countries, captured by 16 of the world’s leading photographers. In each of the 30 countries, Menzel found a statistically average family and photographed them outside their home, with all of their belongings. The result is an incredible cross-cultural quilt of possessions, from the utilitarian to the sentimental, revealing the faceted and varied ways in which we use “stuff” to make sense of the world and our place in it. Though the book is now 17 years old, it is still relevant and it’s still a curious meta-evidence for the material world we live in. Some of these families may have more today, but the disparity is probably the same in most cases. It still circulates. And for another excellent companion read, see Menzel’s 1998 follow-up, Women in the Material World — a fascinating look at an even more intimate aspect of the human family. 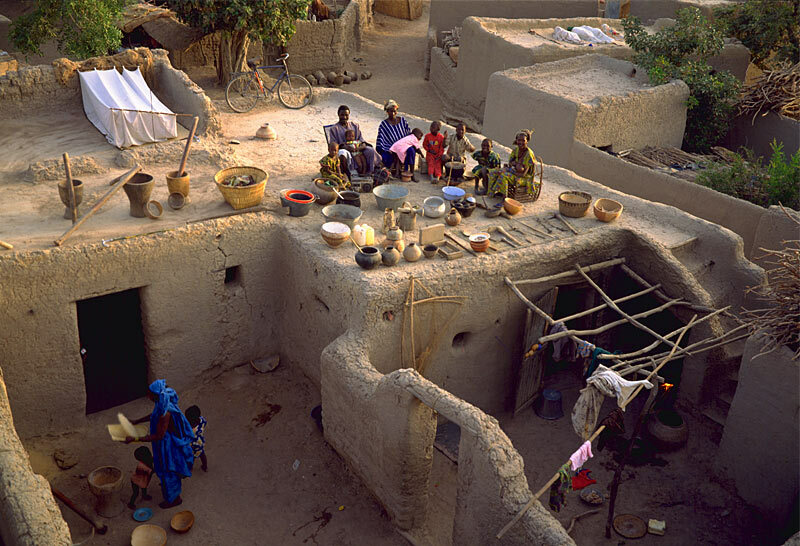 It’s common for men in this West African country to have two wives, as 39-year-old Soumana Natomo does, which increases their progeny and in turn their chance to be supported in old age. 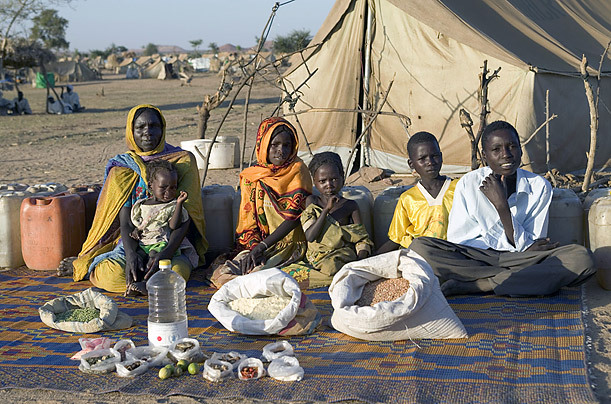 Soumana now has eight children, and his wives, Pama Kondo (28) and Fatouma Niangani Toure (26), will likely have more. How many of these children will survive, though, is uncertain: Mali’s infant mortality rate ranks among the ten highest in the world. Possessions not included in this photo: Another mortar and pestle for pounding grain, two wooden mattress platforms, 30 mango trees, and old radio batteries that the children use as toys. Well known for his eye-opening book Material World: A Global Family Portrait where he asked an average family in 30 locations to empty out their homes to show their possessions, Peter Menzel came up with another brilliant book idea. He teamed up with his wife, Faith D’Aluision, and together traveled the world exploring how the eating habits differ from country to country. Then the duo presented their results in a photo album, called Hungry Planet: What the World Eats. Apart from being interesting and educative, the project brings up some social issues. The exposed weekly grocery list provides information not only about dietary habits, but also about health, economy, lifestyle, etc. It also clearly shows the division between the first world and the developing countries. Interestingly, less affluent families eat more nutritious food than those who could actually afford it. On the contrary, more economically stable families eat more processed food, while fresh products constitute just a small part of their diet. The wife and husband’s team visited 24 different countries and 30 families to photograph them at home, at the market, and surrounded by their weekly food supplies. Toy Stories doesn’t just appeal in its cheerful demeanor, but it really becomes quite the anthropological study. And, ultimately, these photos give poignant insight into poverty on a very basic level – children’s toys. Page through a few of our favorites from the series after the jump, and then be sure to head over to Galimberti’s website to see many more. Where children sleep: a round-the-world tour of bedrooms. Out of sight, out of mind, the phrase continues to plague my perspective. I suppose that’s why traveling’s so important. And that’s exactly what Kenyan-born, English-raised, Venice-based documentary photographer James Mollison explores in Where Children Sleep – a remarkable collaborative project between him and American journalist Chris Booth capturing the diversity of and, often, disparity between children’s lives around the world through portraits of their bedrooms. The project began on a brief to engage with children’s rights and morphed into a thoughtful meditation on poverty and privilege, its 56 images spanning from the stone quarries of Nepal to the farming provinces of China to the silver spoons of Fifth Avenue. Perhaps most interestingly, this project was designed as an empathy tool for nine- to 13-year-olds to better understand the lives of other children around the world, but it is also very much a poignant photographic essay on human rights for the adult reader. 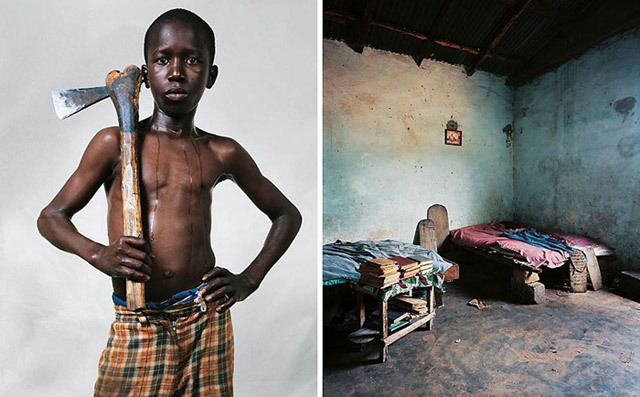 One of the more meaningful photo series I’ve come across in a while, these photographs paint a reality that is difficult to depict through words, revealing shocking differences across countries, going from girls with thousand dollar dresses in their private mansions to shepherd boys sleeping with goats. 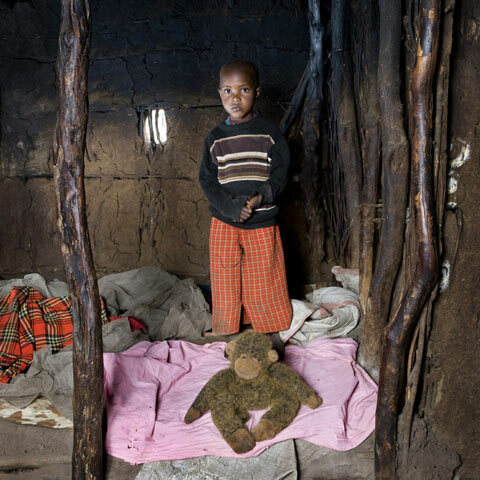 Read on to let Chris Booth and James Mollison show you where children sleep. 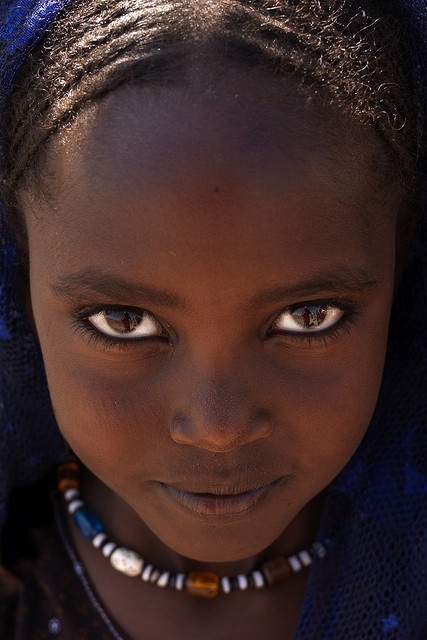 Lamine, 12, lives in Senegal. He is a pupil at the village Koranic school, where no girls are allowed. He shares a room with several other boys. The beds are basic, some supported by bricks for legs. At six every morning the boys begin work on the school farm, where they learn how to dig, harvest maize and plough the fields using donkeys. 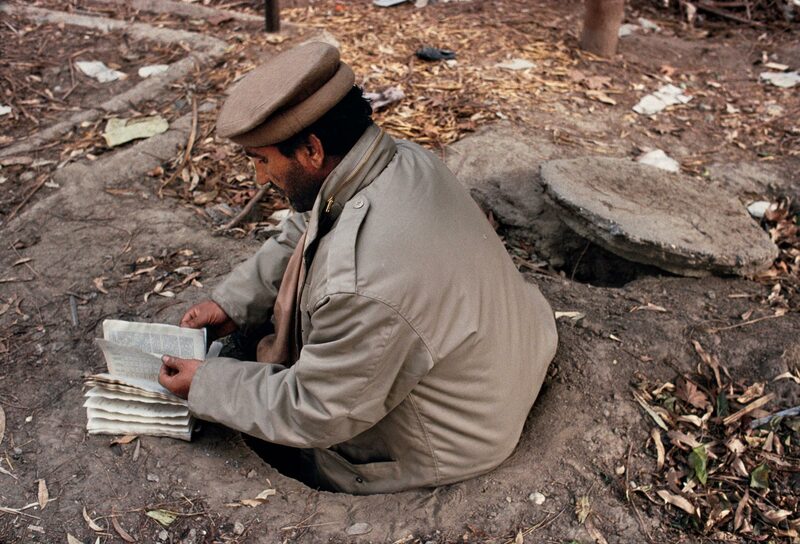 In the afternoon they study the Koran. In his free time Lamine likes to play football with his friends. 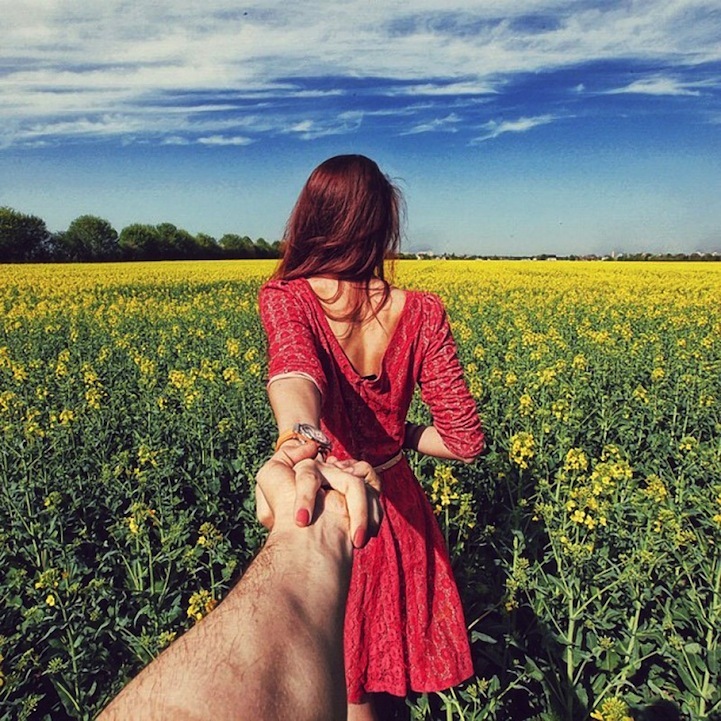 #FollowMeTo: Russian photographer travels the world with girlfriend in cute Instagram photo series. 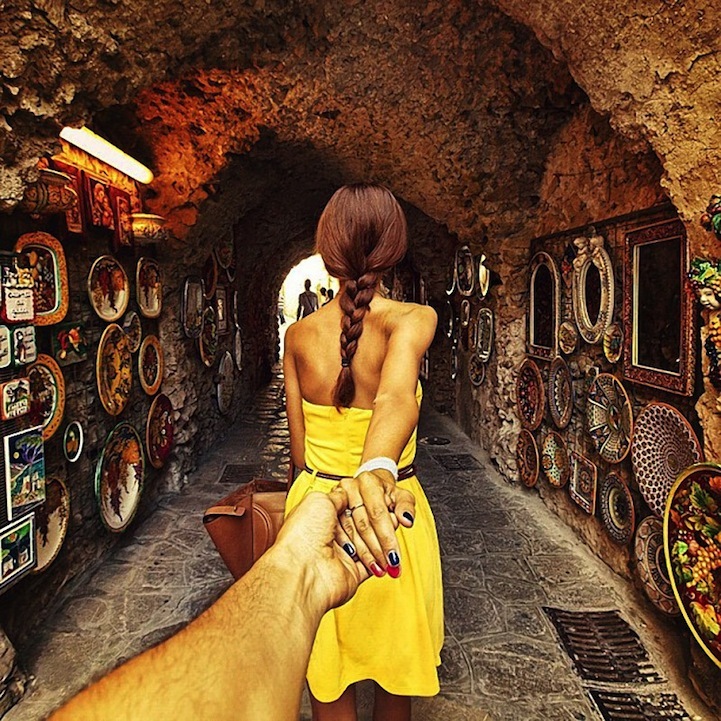 Russian photographer Murad Osmann creatively documents his travels around the world with his girlfriend, Nataly Zakharova, always leading the way in his ongoing series known as Follow Me To. With her back turned, never revealing her face to the camera, Osmann’s girlfriend guides us all on a journey across the globe to some of the most beautiful, exotic, and radiant environments. There are also comforting and familiar settings mixed in for good measure. Whether the couple is spending a romantic night in Moscow, having an exotic adventure in Asia, wandering the streets of Tokyo, or simply going to Disneyland, Osmann keeps a visual record of their escapades as he trails behind his beloved. He shoots the photos either on his iPhone or digital SLR camera and processes them using multiple filters in the Camera+ app before posting on Instagram. Enjoy this exciting series and get inspired. Delicatessen with love: portraits of beautiful grandmas and their cooking around the world. Photographer Gabriele Galimberti’s Tuscan grandmother Marisa said something similar to him before one of his many globetrotting work trips. To ensure he had at least one good meal, she prepared for him a dish of “ravioli ripieni” before he departed for his tour around the world by couchsurfing. 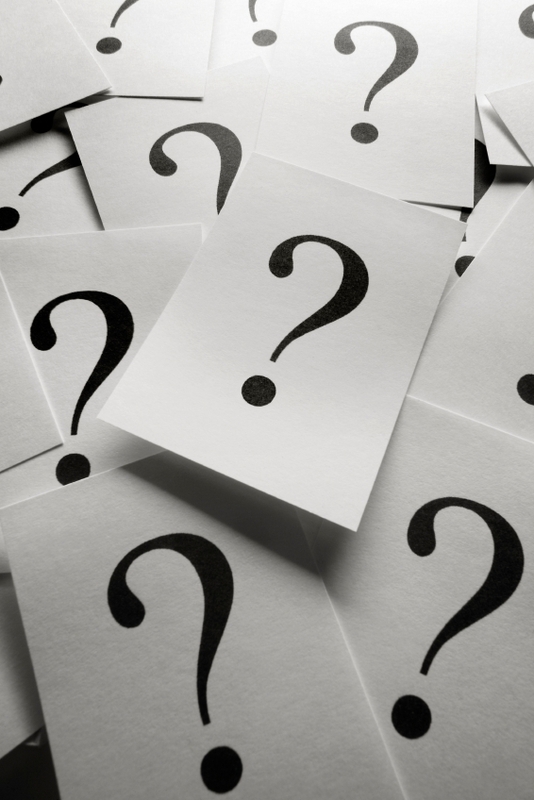 She was not so concerned about the possible risks or mishaps her grandson might face in his adventurous travelling worldwide, but her major concern was, “what will he eat”? That is because only at home you can eat well and healthily. And above all, only your Italian grandmother (and sometimes mum) knows what is best for you. Delicatessen with Love honors the many grandmas who have shown their grandchildren love through their culinary skills. You can’t help but smile as you flip through the series of happy women who are proudly presenting their favorite dishes, and an unexpected pure overwhelming happiness washes over you. 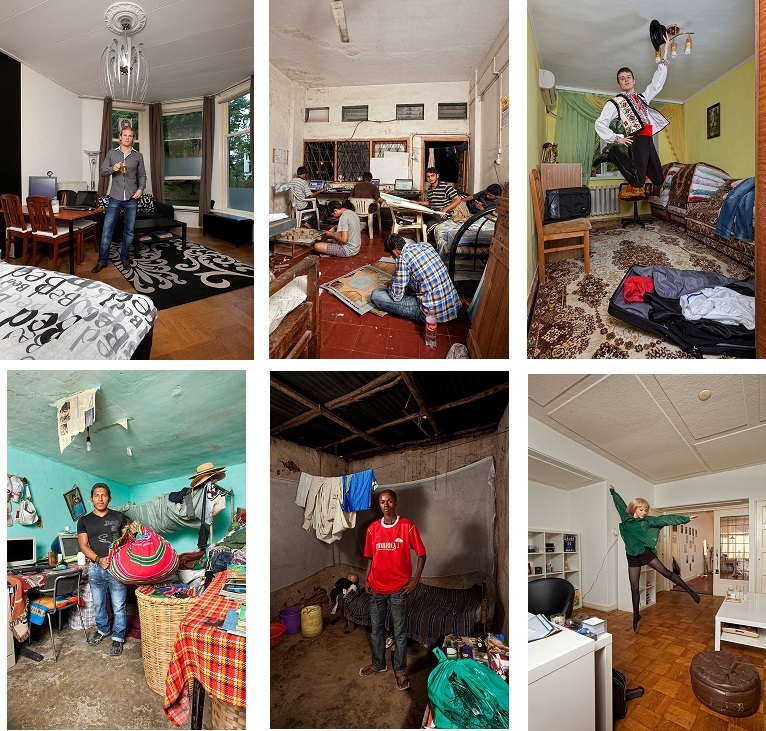 Images Connect: an interesting insight into students’ housing across the world. Images Connect is an international photo project by photographer Henny Boogert that explores the similarities and differences between the places students call “home” around the world. Boogert believes that all students worldwide share the same goals: to move forward and establish a career. Their housing — be it a room, an apartment, a dorm or a hut — is as universal as those goals, and the Images Connect project aims to highlight that universality. He visited 10 countries to capture all of his images: Kenya, Russia, Moldova, Cuba, Bolivia, the Philippines, India, Hong Kong, Italy and his home country of the Netherlands. And even though he chose such a diverse selection of countries, he found much the same thing everywhere he went. “A bed, a small seating area, some posters on the wall and clutter on the ground,” a representation of those goals and, in some cases, the sacrifices required to reach them. In terms of composition there is room for improvement, but the result is, nevertheless, an interesting insight into students’ lives across many cultures.